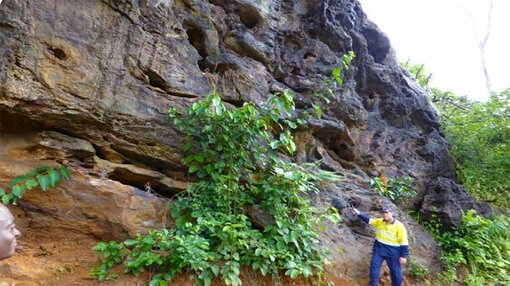 A resource size increase could be on the cards for Tawana Resources NL (ASX:TAW) after it found additional iron ore mineralisation in outcrops at its flagship Mofe Creek project in Liberia. Mofe Creek has a maiden resource of 62Mt at 33% Fe and TAW is working to bring a low cost 2.5Mtpa mine into production that could generate an estimated $2.5BN over a 14 year mine life. Only four of 26 zones of mineralisation identified by TAW at Mofe Creek have been explored to date. To cover more zones, the company recently deployed its full Liberian exploration team into the field to identify further high potential areas. The team is aiming to identify new mineralisation within the main project area and at TAW’s new Mofe Creek South exploration licence. TAW has just received initial drilling results from this campaign showing friable itabirite mineralisation defined in outcrops at Mofe Creek South over a combined 1.4km strike length and at an average grade of 32.4% Fe. The mineralisation is within 3km of TAW’s main deposit at Mofe – the Gofolo Main Resource – and its discovery comes as TAW progresses its Pre-Feasibility Study to bring the project into production. Globally, Liberia was the fifth largest producer of iron ore from 1960 through to the 1990’s, and was the largest exporter of iron ore in Africa. Corporate tax is set at a rate of 30% in Liberia with an Iron Ore Royalty of up to 4.5%, so the economic terms are very favourable for companies like TAW. Seeing the opportunity, TAW entered the country through its 100% acquisition of the Mofe Creek Iron Ore Project, which is located within one of Liberia’s most prolific historic iron ore mining districts. The Project is 10km along strike from the abandoned Bomi Hills mine that produced over 50Mt DSO @ 65% Fe and 20km along strike from the Bea Mountain resource, which is over 100Mt @ 45% Fe. China’s WISCO and the mining giant Arcelor Mittal are also operating in the region and investing heavily in infrastructure. Mofe Creek is just 20km from the coast and 85 km from the strategic and capital City port – Monrovia. This close proximity to an export point allows TAW several haulage options, including road trucking, rail, barge and/or conveyor. The President of the Republic of Liberia, Ellen Johnson Sirleaf, recently appointed an Inter-Ministerial Concessions Committee to negotiate a Mineral Development Agreement to help advance the project. This combination of political stability and support, modern infrastructure and geographical advantage has led to TAW developing plans for a 2.5Mtpa start up operation at Mofe Creek that could be expanded through additional exploration. Mofe Creek’s minerals are coarse grained, high-grade itabirite that can be processed to make a high-grade product of between 64% Fe and 68% Fe at a coarse crush sizing – an in-demand product from steel producers worldwide. The 62Mt maiden resource released by TAW at Mofe Creek is spread over four main areas of mineralisation. Additional drilling will be conducted for the Pre-Feasibility Study now underway, and TAW has set an overall exploration target of 500Mt. TAW’s focus for initial mining is the Gofolo Main target, which has a Maiden Resource Estimate of 23.4MT @ 32.5% Fe (Inferred) plus 10.2MT @ 36.5% Fe (Indicated). TAW has found mineralization 1km-long at Gofolo Main, which is between 60 – 100m wide, with a coarse itabirite outcrop that shows accumulations of +60% Fe. TAW confirmed this deposit has soft, easily mined mineralisation that can be easily processed. Under its projected mining plan, Gofolo Main will represent the first mining “hub” for the Project. Based on TAW’s goal to develop an initial project producing 2.5Mtpa, the company is developing plans to build a modular and mobile beneficiation plant that can be moved around the project area as each area is mined. Costs are estimated to be low, with Opex at US $ 36 – 41/tonne FOB and Capex predicted to be US $52.9m for an initial 1.2 to 1.5Mtpa operation that can be scaled up as required. 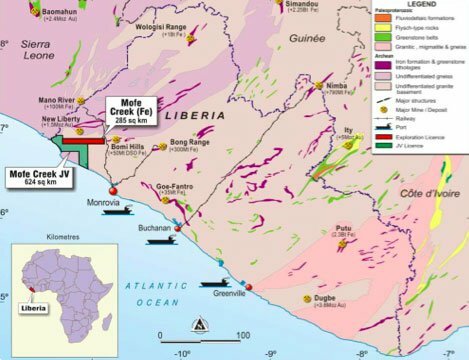 To boost its resources at Mofe Creek, TAW has redeployed its full Liberian exploration contingent into the field to assess its recently acquired, 100% owned MEL1223/14 Mofe Creek South licence. New friable itabirite mineralisation has been identified at the licence in outcrops over a combined 1.4km strike length and at an average grade of 32.4% Fe. The mineralisation is within a 3km trucking distance of the Gofolo Main resource and in the immediate vicinity of where the haul road is to be built. This new mineralisation is from one of four high-priority target areas defined within the Mofe Creek South license, which has a similar geological makeup to the 61.9Mt at 33% Fe maiden resource defined across the main project area. TAW’s Chief Executive Officer, Wayne Richards, says the new iron ore targets could be just the beginning. “This represents the first of a series of exciting new exploration targets which have the potential to add significant resource tonnes to the project, and which are within short conveying or trucking distance to the proposed Gofolo-Zaway mining hubs,” he says. TAW mapping teams are assessing the remaining exploration targets within the license area, with the aim of prioritising more drill targets. The company is also finalising a drilling programme for the Zaway North- West exploration target, within the main project area. The Zaway North-West target is TAW’s highest priority exploration target and an initial 19 hole-programme for a total 1,640m of drilling has been scheduled.